Laura Hope-Gill is a poet, teacher and author of Look Up Asheville: An Architectural Journey and Look Up Asheville II. She is a NCArts Fellow, founding director of Asheville Wordfest and Coordinator of M.A. in Writing Program at Lenoir-Rhyne University Center for Graduate Studies in Asheville. Laura was named the first poet laureate of the Blue Ridge Parkway following the publication of The Soul Tree: Poems and Photographs of the Southern Appalachians. On December 20th she will perform selections from The Soul Tree with musicians at the “Living Room” above the Asheville Visitors Center at 36 Montford at 7 p.m. There is a $10.00/sliding scale admissions cost. Laura graciously agreed to a short interview regarding the book The Soul Tree and the event Thursday night, Soul Tree Solstice. You recently wrote on Facebook that The Soul Tree poems “were the poems I had been preparing (… being prepared?) to write since I first fell in love with the music of language as a child…” If you would, please explain that statement and then tell how they developed into the book The Soul Tree. I view the Soul Tree poems as a miracle in my life. They were the “finishing touch” on a years-long journey to understand something. That something has its stirrings in my childhood. I was a very nature-bound child. I could sit for hours out there just watching, absorbing the air, the sounds, the presences of animals. 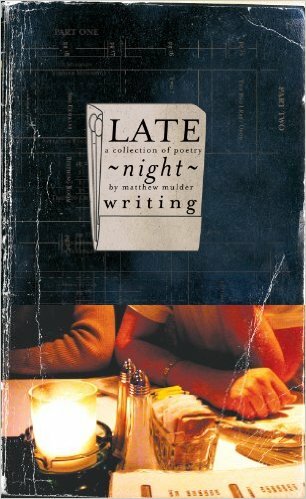 These poems took me back to that, only it was with the knowledge of what felt like all I’ve read and learned and wondered about since that time. I felt all that wonder we can hold as children but lose as we grow older. Somehow the music of language opened it up in me again. What a gift. The Soul Tree poems were (still are?) healing and transformative for you. Explain that process and how these poems have grown you (or are continuing growing you). Still, when I read them, they take me back to that space of awe and wonder. They unjade me, and they bring me back to nature, back to my soul, and that’s where all the medicine is. They grow me because we don’t live in a world where we can walk around with that wonder and awe, that innocence and still work at the good we need to bring into the world. We need to shelve our innocence. We can’t check out and still be effective. What we can do is catch a glimpse from time to time of our divine state, that nascence. I think that’s our awe, the way we feel when a view of the mountains takes our breath away, when something deep inside us connects with something deep inside the earth. It’s a sort of recognition. Writing the poems was a submersion in that recognition. It taught me a lot, much of which I’m still learning to hear when I read them. 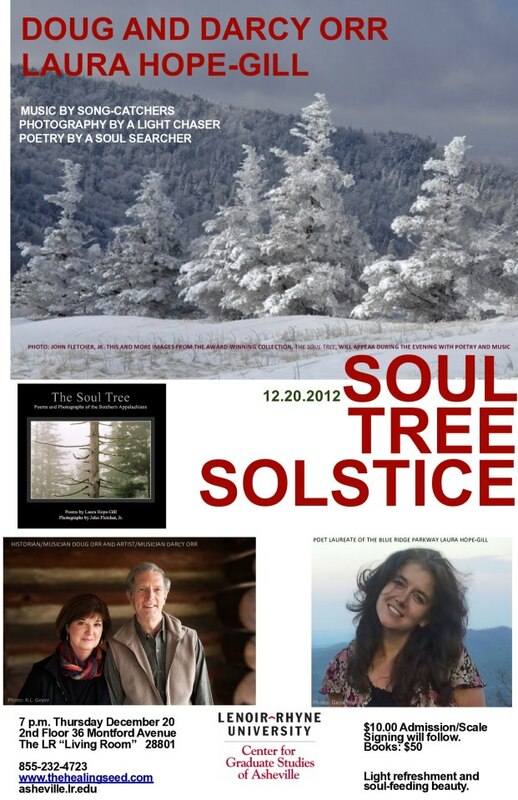 The upcoming Soul Tree Solstice event on December 20th will be the second time that you and Doug and Darcy Orr will perform together. Share about the first time you preformed with them and what people might expect of the upcoming event. Doug and Darcy have invited Joe and Karen Holbert to perform in their place due to a family sadness. We do have plans to continue collaborating, the five of us. A mutual friend gave Doug a copy of The Soul Tree a few years ago. He has since given it to his friends. Recently, he forwarded a note one of these friends had sent to him, thanking him for the book. I was so moved. Also, at that time, I had just given a reading at Lenoir-Rhyne University, and I realized while reading that I was finally “ready” to collaborate musically. I remembered playing with Doug and Darcy in a circle on the grounds of Warren Wilson College at Swannanoa Gathering. That night I was supposed to read on stage with Doug but due to some motherhood scheduling problems I arrived late. We ended up reading and playing together much later, in a much less intentional setting, and there was a magic to it. It was like the poems were home. It’s taken some time, though, for me to be able to read the poems whole. I mean I could get up in front of people and say them, but I was afraid to embody them, because they hold stuff that’s enormous to me. I have long believed that poet has a responsibility when performing to hold the audience in a safe place. The poet has to be solid, to be strong. I can do that with poems written in a voice people are more accustomed to. But the Soul Tree poems had their own voice, something more core. Maybe they were a promise of what I would one day be able to hold. Maybe they were a challenge inviting me to grow into them, that when I did I would be fully standing in myself. I can do that now,and I can read the poems. And I’m thrilled to read them with this extraordinary group of musicians.